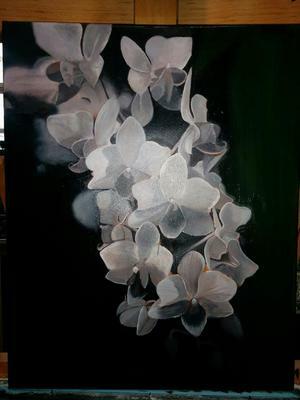 16x20 canvas titled " Pink Orchids". Created for a dear friend, in the Dutch Flemish style, a technique learned from Delmus Phelps. It's has the the toned canvas with the inked drawing, then a burnt umber painting,and a graiselle, or monochrome painting,,,and several color layers until I completed the highlights and details. Thanks Delmus, this method works well for me and really helped me as an artist. Another great example Michael! thanks for posting it. The umber layer didn't make the upload, looks like I got two copies of the gray layer. You can add the umber when you can. I think this is a fantastic work! As an artist who is new to the Flemish method and still learning the ropes, seeing work like this encourages me to continue too. Great job. Michael, I love your Orchids, you did a beautiful painting. Your work speaks for itself!